Burholme's Sean Brady is the current Cage Fury welterweight champion. No matter what happens on Saturday night, Sean Brady will be at UFC Fight Night in Philadelphia at the end of next month. But, for the 26-year-old Burholme native, the outcome of this weekend's Cage Fury Fighting Championships welterweight title bout could be the difference between buying a nosebleed seat and making another man's nose bleed inside the octagon at the Wells Fargo Center. 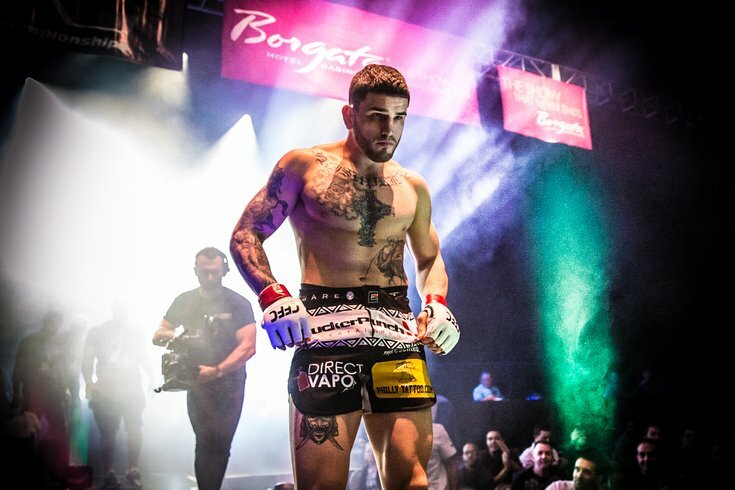 Brady, 9-0 as a professional fighter and 7-0 since joining CFFC, is the locally-based promotion's welterweight champion, a title he will defend against Taj Abdul Hakim on Saturday night at CFFC 72 from the Hard Rock Hotel and Casino in Atlantic City. And a win against Abdul Hakim could lead to an incredibly opportunity for Brady — a shot at making his UFC debut in front of his home crowd, at the same arena where he saw the UFC live for the first time as a high school student back in 2011. As one of the best mixed martial artists not in the UFC, Brady is trying to remain focused on the fight in front of him, but he'd be lying if he said the idea of getting the call up to the big show hasn't crossed his mind. "I think I belong in the UFC," Brady admitted to PhillyVoice during a recent interview. "And, personally, I think that after this fight, this performance I know I'm going to have, I'll prove that I belong there. But it's going to come when it happens. You know, I would love to jump on that Philly card that's coming up, but I have a tough opponent and a tough fight scheduled for [February 16th] so I've really only been focusing on that. I don't try to think about afterward. "But I know what caliber of fighter I am and everybody I train with and know, they know where I belong. So, it will happen. I just have to keep doing what I'm doing and it'll come to me." For Brady, who grew up hanging around and working out in the PAL Center at Rising Sun and Longshore in the Northeast before graduating to the Fox Chase Rec Center on the other side of Cottman Ave., this has been more than a decade of work in the making. And he's gone from training in ju-jitsu and Muay Thai at the small local Semper Fi gym near his house, where he first got his start at the age of 15, to training at Renzo Gracie's Philly gym with some of the best fighters in the world, like former UFC lightweight champion Eddie Alvarez and fellow UFC lightweight (and former CFFC lightweight champ) Paul Felder, who has been friends and training partners with Brady for several years now. After taking his first professional fight at 19, Brady embraced the fighting lifestyle and, with a 9-0 professional record, it shows. As the wins continue to pile up, however, Brady continues to wait for that call from UFC. He's admitted that he's accepted short-notice fights from UFC before, but ultimately he wasn't the fighter selected to hop on a last-minute card and believes that the popularity of his division has played a part in his delay in getting a deal with UFC. "I'm 9-0 and more than half my fights, I've finished. I have good knockouts, I have good submissions, so I don't really know why [I haven't been given a UFC fight yet]," Brady admitted. "But on February 16, I'm going to give them another reason to sign me. I'm going to show them that I belong there. I'll be an asset — I have a huge following and I'll be the next big thing out of Philly. I know that." The only thing standing in the way is that Saturday night title defense against Abdul Hakim, who is 8-1 and is coming off four straight wins. "He's tough, man. He's explosive, he likes to throw wild, wild strikes, and he's unpredictable," Brady said of his opponent. "But I just think I have a better skillset and I'm going to come in more prepared. I've fought people like him before, and I've been prepared. I think it's going to be a good night for me, and a bad night for him." Whether or not that will be enough to get the attention of UFC remains to be seen, but with CFFC 72 airing on UFC Fight Pass, it could be hard for them to ignore. Of course, this is probably the part where you're wondering how Brady plans on fighting again next month after Saturday night's bout. Well, according to the young fighter, six weeks is just enough time for him to train and get his weight right for another matchup, assuming he leaves the Hard Rock octagon in one piece. "As long as I don't have any injuries," Brady said when asked if that was a long enough break. "No fighter ever goes into a fight at 100 percent, since we do eight- to 10-week training camps, grueling training camps. You're always a little beat up. But as long as I come out of this fight with no injuries, I'd turn around in a heartbeat [and take that fight]. It's six weeks, so that would give me just enough time to get my weight back down. If they called me, I'd be happy to get back into training camp and make it happen." It's hard to imagine anything stopping Brady from taking a UFC fight if they called. It's what he's been waiting for since he first started training over a decade ago, and when you add the extra incentive of fighting in front of his home crowd, it "would be a dream come true." "I'm just focusing on this fight and if they come calling, I'll be ready," Brady added. Whether or not they come calling, it doesn't change Brady's plans for March 30, when the UFC is scheduled to make its return to Philadelphia for the first time in the better part of the decade. He'll be at the Wells Fargo Center. The only unknown is what side of the octagon cage Brady will be on when lights come down. "Oh, 100 percent [I'll be there]," Brady said. "It's looking like the fights are going to be good. Edson Barboza and Justin Gaethje are the main event, so that's going to be great." "There's no one from Philly on the card, which is a little strange. It's a fight town. You've got to throw someone from here on there and give them a shot. There are so many guys here that deserve it. And I'm going to show them [on Saturday] that I'm one of them."